Since Halloween was on a Tuesday this year, the weekend before is when we actually got to dress up for our brother and sister in law's Halloween party. 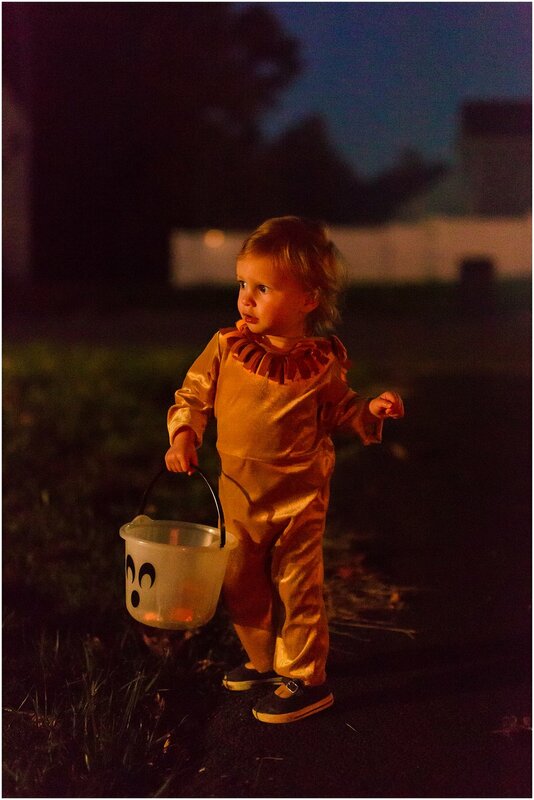 I chose Willow's costume first because she loves making animal sounds and her favorite to make is the lion. So, boom, lion. Then when I realized we were going to a Halloween party I thought of what Erik and I should be and figured we could be Wizard of Oz characters and that would fit with Willow perfectly. But, basically, Erik and I both wanted to be the scarecrow haha. I looked at the Dorothy costumes and thought of making Lily my Toto, but I wasn't feeling it. I mean, Dorothy red slippers alone were going to be at least $25 so I wasn't down with that. Plus, Erik was feeling a little restricted by the "family costume" gag. We did it last year and he didn't want to do it every year. SO! I decided to be Claire from Outlander and told him to be whatever he wanted! Naturally, no ginormous redheaded man would ever let his wife walk around as Claire Fraser without being Jamie. I was actually really surprised he wanted to do that, but it turned out fabulously. As you can see from the photo, Erik went "older, wiser Edinburgh printer" Jamie instead of classic Scottish kilt wearing Jamie. That is mostly because kilts are really expensive and he didn't have to buy much for this costume... he had enough old pirate/Sweeney Todd accessories lying around to pull it off. We took Willow to her first pumpkin patch adventure! 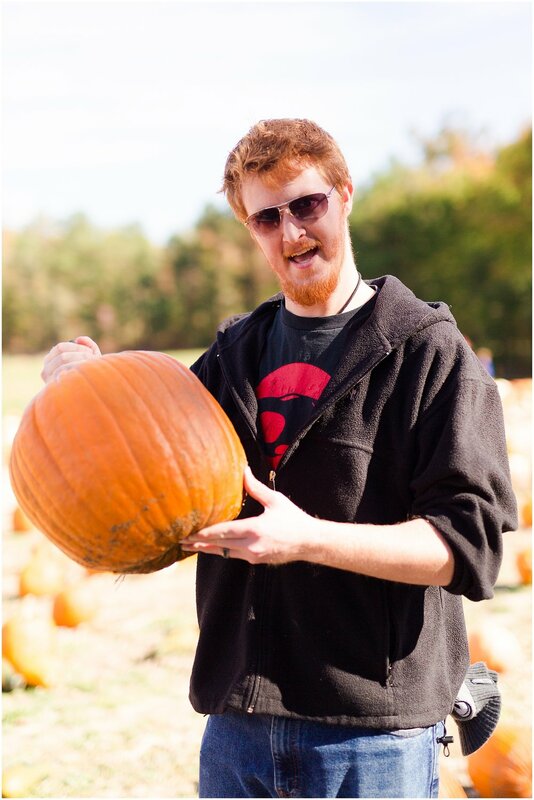 My parents met us at Skinquarter Farm and we really enjoyed the hay ride, the corn maze, the toys, and of course picking our pumpkins. Willow ran around trying to pick them all up. 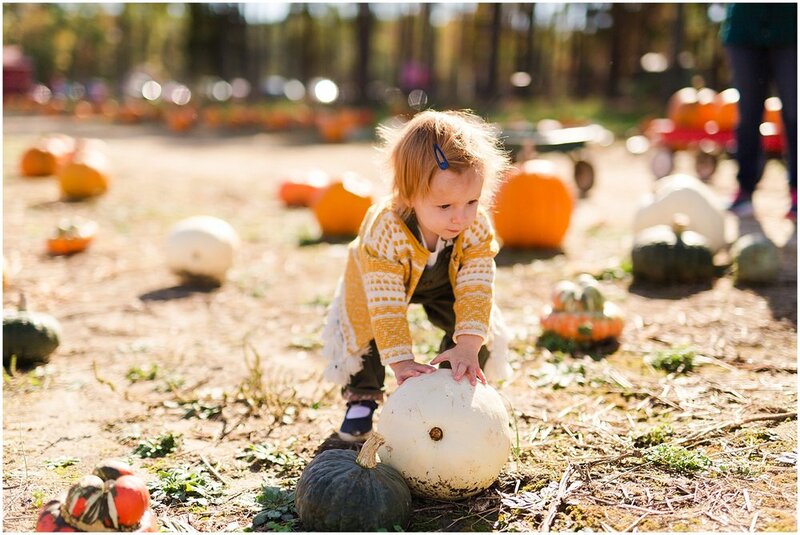 She had an obvious affection for the white pumpkins that I thought was interesting. And we topped the morning off with ice cream before we went. (Like, an unreasonably large amount of ice cream for 11am). When the big day finally arrived, Erik came home from work early to start carving pumpkins. Three pumpkins. 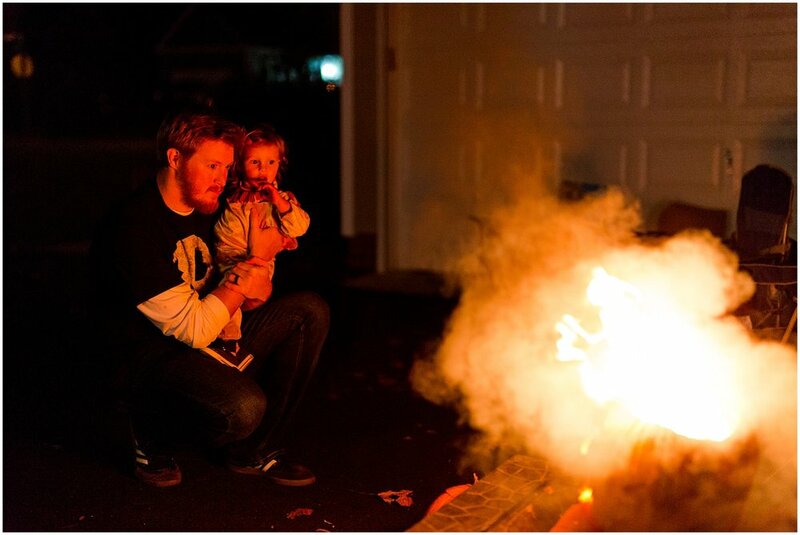 Erik always has a vision for his pumpkin masterpiece and ever since he added fire into the mix, he just can't quit it. 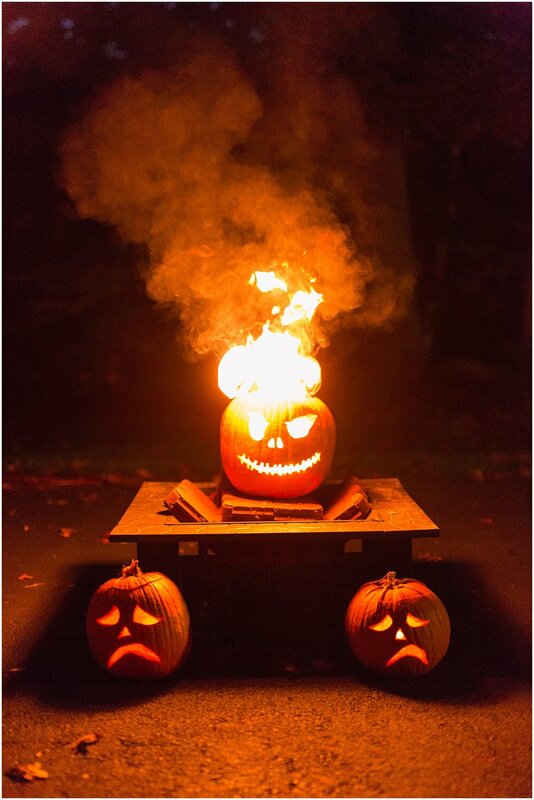 He had an awesome idea to have one big flaming pumpkin, cackling happily... and two little pumpkins who were sad with no fire and instead, dry ice that would give them a creepy, sad vibe. It would have been wonderful, however, dry ice is really hard to come by on the day of Halloween. I went to three places and called more than that. So lesson was learned for next year. But other than that disappointment we had a great time! I made chili while Erik carved to the sounds of Nightmare Before Christmas. His mom came to visit and see our tiny trick or treater. 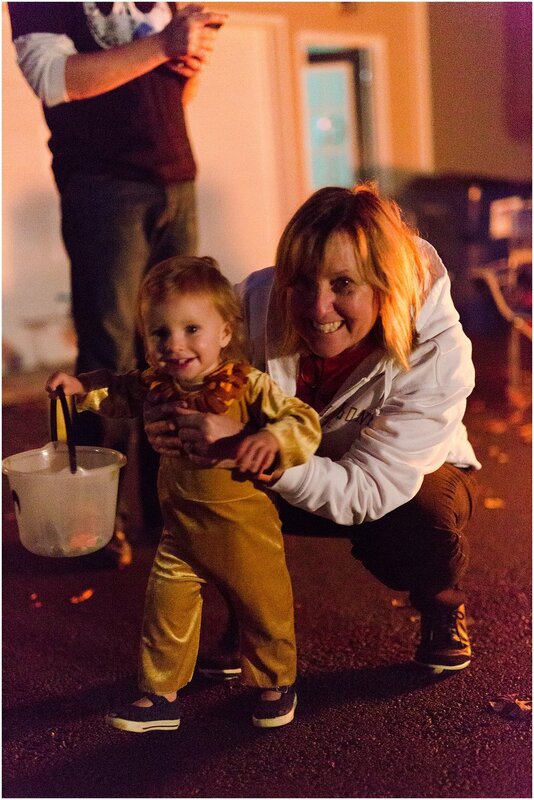 Willow, of course, thought trick or treating was just the best. For the next week, she was running toward the street and wanting to take walks up and down, attempting to go down people's driveways to visit them all again. She didn't really know what she was collecting, but she liked that she was collecting something! We only went to maybe six houses. It was a very short trick or treat adventure. But at the last house, she started sobbing because someone scared her and we decided to cut it off and get her home since, well, when trick or treating starts, that's Willow's bedtime and she was exhausted from what had already been a very fun, but long day. I think her favorite thing was running through the fog from the fog machine anyway. After Willow went to bed, we sat outside by Erik's flaming pumpkin art and enjoyed some pumpkin mead, warm roasted pumpkin seeds, and Halloween candy of course. It was nice. It's always fun to see the trick or treaters. And we got to chat with our neighbors more than usual. Overall it was a really fun holiday and I know it's just going to get more fun as Willow gets older and really understands what's going on. She makes everything so much more exciting and fresh. I can't wait for her to choose her own costumes and help carve the pumpkins. 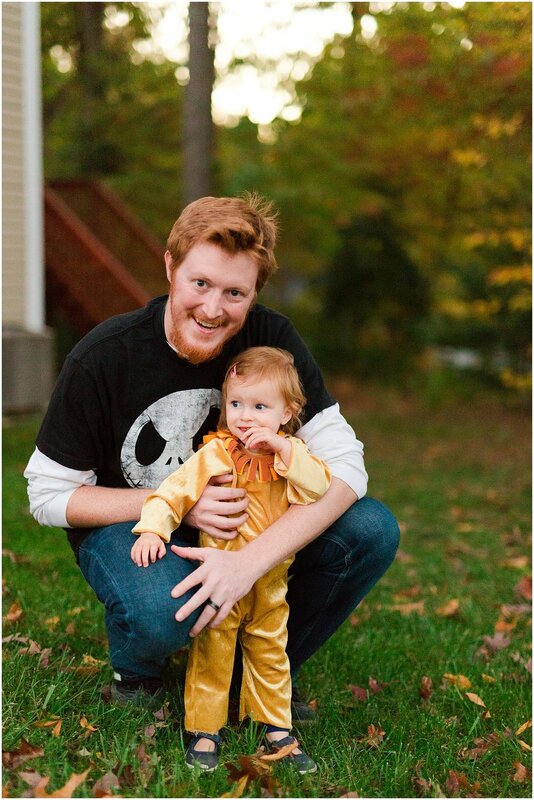 Let's just hope she loves Halloween half as much as her daddy does.